Never one to miss an opportunity to challenge the ‘norm’, Rory gives us his thoughts on four key areas – trustees, education, advisors, and the future pensions landscape. In the first of these blogs, Rory shares his knowledge and expertise on the vital role of the pension trustee. Pension fund trustees are pivotal to the success or failure of any pension scheme. 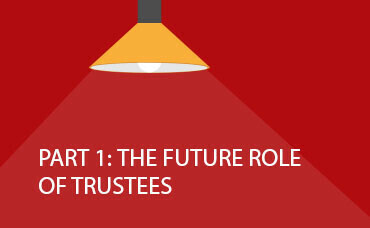 Be it a defined benefit (DB) scheme or a master trust defined contribution (DC) plan, it is the trustee that is the guiding light, steering the plan towards the best possible results for members. With the increasing level of regulation and compliance, I can tell you, it’s not a job for the faint-hearted. It’s hard to get a definitive number as to how many pension trustees there are but I have seen figures that suggest the number could be 30,000 plus. They range from professional trustees to independent trustees to what we call lay trustees. And I want to suggest to you – and with all due respect to the independent and professional trustees – that it is these lay trustees that are the jewels in the crown of the pension trustee boards in this country. There is a trend gathering pace that says that perhaps all trustees should be ‘professional’. That way, it is argued, the decisions made will be more coherent, more understanding of business. But I couldn’t disagree more. There is a cabal of about 200 professional trustees in the UK and that is quite enough thank you very much. I believe that one of the key strengths of a trustee board is the diversity of life skills that each individual brings to the board. When you sit in a trustee board meeting it matters not a jot whether you are a so called expert or a cashier or a pilot or a seafarer – what matters is your ability to evaluate what you are being told, to be prepared to question what you don’t understand, and to make decisions that are clear and for the good of the fund. I think it would be a big mistake to lose this diversity. To have professional trustees that perhaps come from or work intimately with the adviser classes would be very dangerous and a backward step. Indeed it would be a merry-go-round of the great and the good and the connected perpetuating the perfect job creation scheme. No, let’s celebrate the diversity in our pension trustees, and let’s strengthen the opportunities for ordinary working people to sit on the boards of the funds that look after and invest in, what is after all, nothing more than deferred pay. Next time Rory looks at the issue of trustee and member education.